I'm back from my holiday and before you think it, no I didn't bring this rotten rain with me. I do think the weather gods conspire to throw torrential rain at you when you return from holiday. It adds to the whole depressing experience! 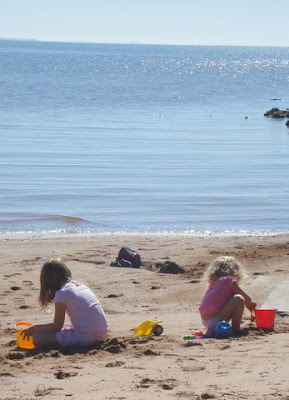 Don't you love the little trail the short one has made walking back and forth to the water to fill her bucket? I suspect the taller one was doing a little bossing around don't you? Needless to say, we had a wonderful time with my family and I even got some hand sewing done whilst watching endless episodes of Australian MasterChef with my Mum. So I now have ridiculous amounts of unpacking to do, which is very depressing but a certain someone decided to put a great big smile on my face this morning. Look what arrived for me in the post today. It's a wonderful parcel from Megan of Mousehouse. I ordered these gorgeous personalised applique pillowcases from her just before I went away. They came so beautifully wrapped and with some gorgeous tags and a very funny card (it reads, my life would be so much nicer if only my Mother would stop knitting). Thank you Megan, you really put a smile on my face and I can see a lot more orders coming your way for these pillowcases. They are divine!! Megan is having a giveaway on her blog which is definately worth entering. Pop along and join in now. My facebook giveaway closes at 6pm today, Kiwi time, so if you haven't already, head over there and make a last minute entry. Ooh brrr! That water looks cold! Isn't it nice when lovely things arrive in the mail? Your girls will have those pillowcases forever! And your hand sewing is very impressive. 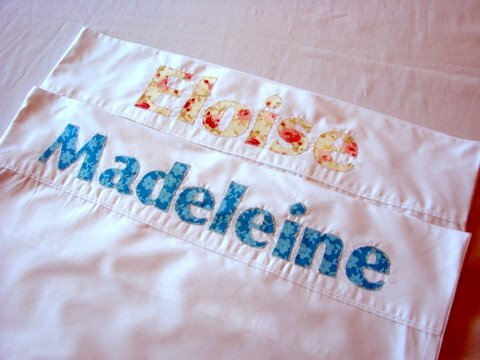 Love this post, fantastic pillowcases. 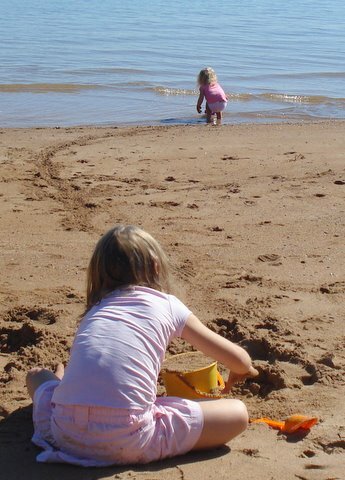 Welcome home to winter :( Made me sigh to see your daughters having fun at the beach, only a few short months and we can do that without thermals and windbreakers! Isn't Megan clever! 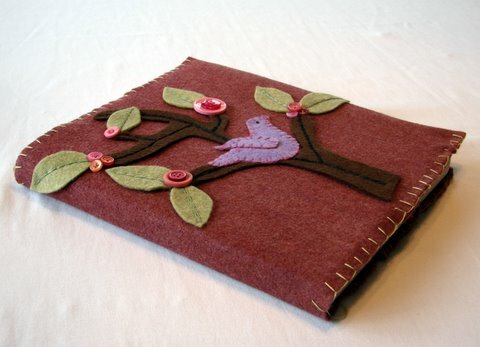 I love the journal cover - I have one on my list of 'to dos'. Did you use a stabalising backing for the felt or just as is? Welcome home - sounds like you had a lovely holiday. Your journal cover is amazing!